The fact that health can both increase and decrease means that value and cost in ENL can be either positive or negative. Something we consume can be nutritious and thus have positive value. But consumption can also be detrimental, for example through mercury pollution in fish, certain fats in fried foods, and ingredients that lead to obesity. Such effects are captured through negative value. Similarly, when we engage in production we can incur injuries or debilitating fatigue. These are positive costs, resulting in lower health. But labor can also enhance our fitness and vitality, resulting in negative costs and higher health. This perspective will likely entail a mental adjustment for many economic thinkers because they are accustomed to monetary interpretations of value and cost. 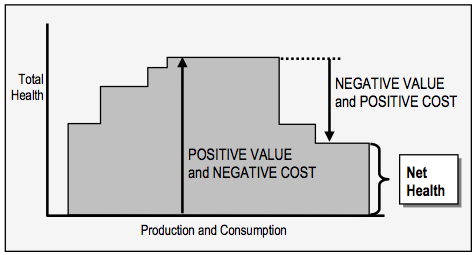 While negative numbers frequently occur in accounting, the use-value or utility of commodities is always positive. There is no analogue in standard thought to ENL's negative potential and effectual value. Likewise, when a capitalist purchases labor, materials, and other inputs, the monetary outlays will invariably be positive — there is no analogue to negative input cost. This aspect of ENL's value and cost concepts is necessary given the subject matter it addresses: the complex, largely material world of humankind and nature, where both enhancement and degradation are possible. Under capitalism these complexities are reduced to one-dimensional monetary representations, which are duly reflected in the one-dimensional quantities of standard economics. The figure below graphically depicts the two-sided nature of ENL's key quantities. Health increases through positive value and negative cost. It decreases through negative value and positive cost. The health of human beings increases from economic activities that result in either positive value or negative cost. These are shown in the middle of the diagram. Conversely, health decreases from activities that result in either negative value or positive cost. These are shown at top right. When losses are subtracted from gains, the result is the net health achieved. This is the overall impact on health from engaging in economic activities, and is shown in the diagram at bottom right. In this respect ENL is similar to cost-benefit analysis (CBA) in standard economics. However, the value and cost quantities used in CBA are based on the conventional concepts of subjective value and opportunity cost, not on objective value and cost. In addition, ENL applies to all major economic activities, not just government projects and selected private projects.